Over the next five years, the city plans to start work on 150 miles of projects – nearly as much as it’s done in the past 15 years. The city has also learned a lesson from the effort: It’s no longer making promises about when it all might be finished. About 20 years ago, city officials found a new way to get cash for a long-running, never-ending effort to move all power lines underground. In 2002, the city asked San Diego Gas & Electric to increase every city resident’s rates by about $3 a month and then turn all that money over to the city. The city expected hundreds of millions of dollars in new money from ratepayers would allow the city to bury all overhead power lines within 20 or 25 years. Even as more money kept coming in, the city kept pushing back the deadline to finish the effort. By 2012 – a decade into the city’s ambitious 20-year plan – officials began to tell city residents they might have to wait another 54 years. Now, the city, burned by useless estimates, isn’t making any promises about when it will finish this work. California’s major utilities had been working to remove overhead power and telecommunications lines since Ronald Regan was governor, though Los Angeles first began burying unseemly power lines in the early-1900s. Progress has been slow, as everyone who pays any attention to the undergrounding saga knows. It’s taken so long that “underground” has become a verb in some circles. The work to underground power lines is partly aesthetic. Notice that most high-trafficked areas and business districts don’t have overhead lines anymore. There are also health, safety and reliability issues. Overheard power lines have started some of the state’s most devastating wildfires. The city manages its own undergrounding program by picking which projects get done when. But the city has to work with SDG&E and local telecommunications companies to fund the projects and coordinate the actual work. SDG&E takes the lead on that, since it covers the whole city and because its electrical needs have priority. In San Diego, most of the money for all this work comes from SDG&E. The company collects money from ratepayers, gives the money to the city, then the city then sends money back to SDG&E, which hires contractors to do the actual work. Nationally, it costs anywhere from $100,000 to $5 million to bury a mile of utility lines, according to trade industry estimates. Work is more expensive in cities, because streets need to be dug up and repaved. Some lines run through alleyways but need to moved underground through streets, which also requires some reconfiguration on people’s property, something that the program pays for. While some homeowners have complained about the work, most neighborhoods are eager to have their lines buried. In the past, in interviews for various stories over the years, some homeowners have seemed to come face to face with their mortality when they’ve heard how long they must wait until undergrounding comes to them – they may be six feet underground before their power lines are. Other residents may not even notice there’s a problem or that some neighborhoods have overhead lines while others do not. Lawmakers and regulators, not to mention homeowners eager to remove unsightly lines, have criticized the program for taking so long. That, though, is a function of the gradual way it’s being funded. For decades, a small percentage of power bills have gone to pay for undergrounding. Most of those fees are known as “20A” funds, to distinguish them from other types of undergrounding-related fees. Starting in 2001, city officials wanted to speed things up and worked to introduce another fee on SDG&E’s bill just for residents of the city. Officials saw an opening to increase power bills to pay for this because, by coincidence, it was time to amend a real estate deal between the city and the power company. 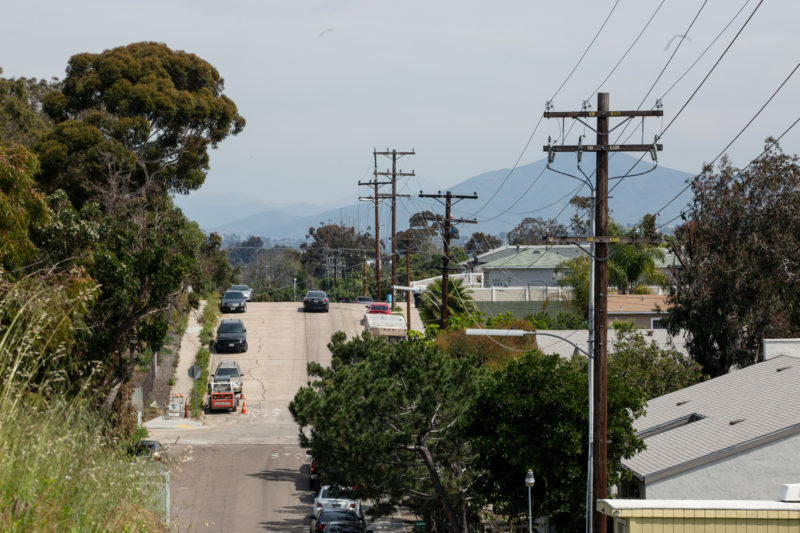 SDG&E pays San Diego each year to put its equipment — including poles, wires and underground lines — within city rights of way. The city asked SDG&E to raise rates to speed up the undergrounding process. By then, 229 miles of lines had been buried since 1970. The deal needed and received special approval from the California Public Utilities Commission. In the years since the city asked SDG&E to raise rates, another 200 miles of lines were buried. That’s faster, but not quite as fast as the city hoped. Another 1,238 miles of lines are still strung out overhead. Jim Nabong, a city program manager in charge of undergrounding, said the city can only go as fast as the funding allows. But the city admits that in recent years it actually hasn’t used all the money that’s come in from the surcharge. It’s done about eight miles of undergrounding work each year using surcharge money, though it should have been able to pay for about 12 miles a year. At the end of the last budget year, there was $183 million sitting in a surcharge fund. The city now is working to speed up how quickly it uses that money. Over the next five years, it plans to start work on 150 miles of projects – nearly as much as it’s done in the past 15 years. This isn’t the first time city officials have said they have not been spending as much money as they’ve been collecting. The city and SDG&E both believe they are now on the same page and on track to really get rolling. “Together, the city of San Diego and SDG&E’s highly trained professionals are working to accelerate undergrounding projects, which is in part due to recent joint efforts to streamline existing procedures, close gaps in our respective methods and establish an approach to ensuring the remaining electric overhead distribution lines throughout San Diego are undergrounded safely, efficiently and in the most cost-effective way possible for the benefit of residents and businesses,” SDG&E spokesman Wesley Jones said in an email. But the city learned another lesson from the last go-around of making promises about when it would be done with the whole effort. Giving residents long-term estimates of when their lines will be buried is a recipe for broken promises and frustration. So, now the city only projects what projects will be started over the next five years. In other words, it’s stopped making promises. Correction: An earlier version of this post misidentified the reader who submitted this question. It was Steve Ravellette.